Cycads (division Cycadophyta) are an ancient group of seed plants characterized by a large crown of compound leaves and a stout, erect trunk up to seven meters (23 feet) high. They are evergreen, gymnospermous, dioecious (separate male and female) plants having large pinnately compound leaves. They are frequently confused with and mistaken for palms or ferns, but are not closely related to either, belonging to their own division of plants. 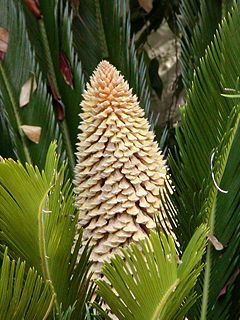 Like the other seed plants traditionally grouped as gymnosperms (conifers and gingkos), cycads produce seeds that grow naked on the scales of a cone-like structure rather than enclosed within a carpel (female reproductive organ of a flower). The seeds of some species develop a fleshy coating that gives them a fruit-like nature similar to the true fruits produced by angiosperms (flowering plants). Cycads offer a unique reflection of the diversity in nature. They are renowned for survival in harsh semi-desert climates, and can grow in sand or even on rock. They are able to grow in full sun or shade, and some are salt tolerant. Though they are a minor component of the plant kingdom currently, during the Jurassic period they were extremely common. Cycads have very specialized pollinators and have been reported to fix nitrogen in association with cyanobacteria living in the roots. The cyanobacteria are a prokaryotic "blue-green algae" which produces a neurotoxin called BMAA that is found in the seeds of cycads. Cycads today are found across much of the subtropical and tropical world. They are found in South and Central America (where the greatest diversity occurs), Australia, the Pacific Islands, Japan, China, India, Madagascar, and southern and tropical Africa, where at least 65 species occur. Overall, species diversity peaks at 17˚N and at 28˚S, with a minor peak at the equator. There is, therefore, not a latitudinal diversity gradient toward the equator but toward the tropics. However, the peak in the northern tropics is largely due to the genus Cycas in Asia and the genus Zamia in the New World, whereas the peak in the southern tropics is due to the genus Cycas again, and also to the diverse genus Encephalartos in southern and central Africa and Macrozamia in Australia. Thus, the distribution pattern of cycad species with latitude appears to be an artifact of the geographical isolation of cycad genera, and is dependent on the remaining species in each genus that did not follow the extinction pattern of their ancestors. Cycas is the only genus that has a broad geographical range and can thus be used to infer that cycads tend to live in the upper and lower tropics. This is probably because these areas have a drier climate with relatively cool winters; while cycads require some rainfall, they appear to be partly xerophytic (adapted to dry environments). 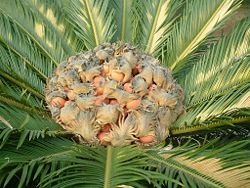 Modern knowledge about cycads began in the ninth century with the recording by two Arab naturalists that the genus Cycas was used as a source of flour in India. Later, in the sixteenth century, Antonio Pigafetta, Fernao Lopez de Castanheda, and Francis Drake found Cycas plants in the Moluccas, where the seeds were eaten. The first report of cycads in the New World was by Giovanni Lerio in his 1576 trip to Brazil, where he observed a plant named ayrius by the indigenous people; this species is now classified in the genus Zamia. Throughout the eighteenth and nineteenth centuries, numerous naturalist researchers and discoverers traveling throughout the world reported the discovery of new species. One of the most notable researchers of cycads was American botanist C.J. Chamberlain, whose work is noteworthy for the quantity of data and the novelty of his approach to studying cycads. His 15 years of travel throughout Africa, the Americas, and Australia to observe cycads in their natural habitat resulted in his 1919 publication of The Living Cycads. This text is a data-rich volume that which remains current in its synthesis of the taxonomy, morphology, and reproductive biology of cycads, most of which was obtained from his original research. His 1940s monograph on the Cycadales (the order comprising the three families of Cycads), though never published (most likely because of his death) was never used by botanists. There are no other complete works on the cycads. Starch is obtained from the stems of cycads. It has been used as food by some indigenous tribes. Tribal people grind and soak the nuts to remove the nerve toxin, making the food source generally safe to eat, although often not all the toxin is removed. In addition, consumers of bush meat may face a health threat if the meat comes from game that may have eaten cycad nuts and carry traces of the toxin in body fat. There is some indication that the regular consumption of starch derived from cycads is a factor in the development of Lytico-Bodig disease, a neurological disease with symptoms similar to those of Parkinson's disease and ALS. Lytico-Bodic and its potential connection to cycasin ingestion is one of the subjects explored in Oliver Sacks' 1997 book, Island of the Colorblind. Sago flour is generally made from true palms—not from the cycad popularly known as "Sago Palm" (Cycas revoluta). Cycads can be cut up into pieces to make new plants or direct planting of the seeds. Propagation by seeds is the preferred method of growth, and two unique risks to their germination exist. One is that the seeds have no dormancy; the embryo biologically needs to maintain growth and development, which means if the seed dries out, it dies. The second is that the emerging radicle and embryo can be very susceptible to fungal diseases in its early stages when in unhygienic or excessively wet conditions. Thus, many cycad growers pre-germinate the seeds in moist, sterile mediums such as vermiculite or perlite. However pre-germination is not necessary, and many report success by directly planting the seeds in regular potting soil. As with many plants, a combination of well-drained soil, sunlight, water, and nutrients will help the young plant to prosper. However, because of their hardy nature, cycads do not necessarily require the most tender or careful treatment—they can grow in almost any medium, including soil-less ones. One of the most common causes of cycad death is from rotting stems and roots due to over-watering. Some insects, particularly scale insects, as well as some weevils and chewing insects, can damage cycads, though the pests are susceptible to insecticides such as the horticulture soluble oil white oil. Sometimes bacterial preparations may be used to control insect infestation on cycads. While weevils are viewed as pests for the damage they can do to cycads, they also in some cases aid in pollinating the mature plants. Cycads are generally considered to be slow growing, but there are a few species that grow quite fast, achieving reproductive maturity in 2 to 3 years (as with some Zamia species). Other species such as the Cycas, Australian Macrozamia and Lepidozamia, mature in 15 years. The production of seeds distinguishes the two traditional seed plants (gymnosperms and angiosperms) from other members of the vascular plants. Historically, cycads were one of four groups of gymnosperms, a group in which the seeds are not in a true fruit (although occasionally fleshy structures may cover the seed), unlike the angiosperms (flowering plants), which cover their seeds by including them in a true fruit and bear the reproductive organs in a structure called a flower. However, fossil finds suggest that the angiosperms evolved from a gymnosperm ancestor, which would make the gymnosperms a paraphyletic group if all extinct taxa are included. So, while the term gymnosperm is still widely used for non-angiosperm seed-bearing plants, the plant species once treated as gymnosperms are usually distributed into four groups that now hold equal rank as “divisions” within Kingdom Plantae. A division is the equivalent of a phylum in the animal kingdom. Cycads are placed in the division Cycadophyta. There are currently 305 described species, in 10-12 genera, and 2-3 families of cycads (depending on taxonomic viewpoint). The classification below, proposed by Dennis Stevenson in 1990, is based upon a hierarchical structure based on cladistic analyses of morphological, anatomical, karyological, physiological, and phytochemical data. Cycas. About 90 species in the Old World from Africa east to southern Japan, Australia, and the western Pacific Ocean islands; type: C. circinalis L.
Ceratozamia. 16 species in southern Mexico and Central America; type: C. mexicana Brongn. Zamia. About 60 species in the New World from Georgia, U.S., south to Bolivia; type: Z. pumila L.
The number of species in the clade is low compared to the number of species in most other plant phyla. However, paleobotanical and molecular research indicates that diversity was higher in the history of the phylum. Fossil evidence shows that structural diversity in Mesozoic (251-65 million years ago) cycad pollen "considerably exceeds that seen in surviving genera today." The disparity in molecular sequences is very high between the three main lineages of cycads, implying that genetic diversity in the clade was once high. This later fact has led to major disagreements about the divisions within the Cycadales. The number of described cycad species has doubled in the past 25 years, mostly due to improved sampling and further exploration. Experts assume there may still be about 100 undescribed species, based on the rate of discovery. These are likely to be in Asia and South America where the incidence of endemism (existing as unique local species) is currently highest. Diversity hotspots also occur in Australia, South Africa, Mexico, China, and Vietnam, which together account for more than 70 percent of the world’s cycad species. Cycad systematists generally do not adhere to the biological species concept, as clearly defined cycad “species” can interbreed and produce fertile offspring. This character thus is not disproportionately weighted when determining species barriers. The phenetic species concept, which states that a species is defined based on overall similarities with other individuals of the same species combined with a significant gap in variation with other species, is also rejected. Most cycad taxonomists agree on a modified version of the evolutionary species concept, termed the "morphogeographic" species concept, which recognizes the combined effects of geographical isolation and morphological disparity. Thus, the presence of large geographical gaps in cycad distribution has greatly affected the way cycads are classified. 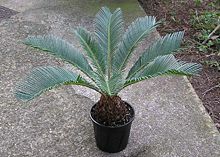 The cycad fossil record dates to the Early Permian, 280 million years ago (mya). There is controversy over possible older cycad fossils that date to the late Carboniferous period, 300-325 mya. One of the first colonizers of terrestrial habitats, this clade is thought to have likely diversified extensively within its first few million years, although the extent to which it radiated is unknown as relatively few fossil specimens have been found. The regions to which cycads are restricted probably indicate their former distribution on the supercontinents Laurasia and Gondwana. The family Stangeriaceae (named for Dr. William Stanger), comprising only three extant (living) species, is thought to be of Gondwanan origin as fossils have been found in Lower Cretaceous deposits in Argentina, dating to 70–135 mya. Zamiaceae is more diverse, with a fossil record extending from the Middle Triassic to the Eocene (54–200 mya) in North and South America, Europe, Australia, and Antarctica, implying that the family was present before the break-up of Pangaea. Cycadaceae is thought to be an early offshoot from other cycads, with fossils from Eocene deposits (38–54 mya) in Japan and China, indicating that this family originated in Laurasia. Cycas is the only genus in the family and contains 99 species, the most of any cycad genus. Molecular data has recently shown that Cycas species in Australasia and the east coast of Africa are recent arrivals, suggesting that adaptive radiation may have occurred. The current distribution of cycads may be due to radiations from a few ancestral types sequestered on Laurasia and Gondwana, or could be explained by genetic drift following the separation of already evolved genera. Both explanations account for the strict endemism across recent continental lines. There are no documented cases of sympatric speciation in cycads and allopatry appears to be the most common form of speciation in the group. This is difficult to study as they are long-lived plants, and so natural phenomena have been investigated. One example is Cycas seemannii, which occurs only in Fiji, New Caledonia, Tonga, and Vanuatu. Genetic diversity within populations was found to be significantly lower than between islands, suggesting that genetic drift is a likely mechanism for speciation, and is probably currently occurring between the isolated populations. Allopatry has also been proposed as the mechanism of speciation in Dioon, which predominantly occurs in Mexico. The many rivers that have shaped the region, and repeated glaciation and consequent disjunction, are thought to have been important in reproductive isolation not only in Dioon but in many other plant and animal taxa. Parapatric speciation may also have occurred, especially as cycads are pollinated by insects rather than by wind. As the range of the species grows, the individuals furthest apart are prevented from interbreeding as insects have relatively small ranges and will not pollinate between these plants. If sympatric speciation has occurred in cycads this would most likely be because of a host shift in pollinators, due to the very fact that cycads are uniformly dioecious, plants being either male or female. The probable former range of cycads can be inferred from their current global distribution. For example, the family Stangeriaceae contains only three extant species, all in Africa. Diverse fossils of this family have been dated to 135 mya, indicating that diversity may have been much greater before the Jurassic and late Triassic mass extinction events. However, the cycad fossil record is generally poor and little can be deduced about the effects of each mass extinction event on their diversity. Instead, correlations can be made between the number of extant gymnosperms and angiosperms. It is likely that cycad diversity was affected more by the great angiosperm radiation in the mid-Cretaceous than by extinctions. Very slow cambial growth (secondary growth expanding the stem or trunk) was first used to define cycads, and because of this characteristic it is considered that the group could not compete with the rapidly growing, relatively short-lived angiosperms, which now number over 95,000 species, compared to the 947 remaining gymnosperms. It may be considered surprising that the cycads are still extant, having been faced with extreme competition and five major extinctions. The ability of cycads to survive in relatively dry environments, where plant diversity is generally lower, and their great longevity may explain their long persistence. In recent years, many cycads have been dwindling in numbers and may face risk of extinction because of theft and unscrupulous collection from their natural habitats, as well as from habitat destruction. About 23 percent of the 305 extant cycad species are either critically endangered or endangered, 15 percent are vulnerable, and 12 percent near threatened. Thus, 38 percent of cycads are currently on the IUCN Red List (2004), and the other 62 percent are in the Least Concern or Near Threatened category (i.e. not actually on the Red List) or are data deficient. This value has changed dramatically within the past few years. In 1978, 46 percent of cycads were on the Red List; this rose to 82 percent by 1997 and then dropped to the 38 percent of 2004. This recent drop in numbers on the Red List is due largely to the recent discovery of over 150 new species and disagreements and uncertainty about classification. This has not been helpful for conservation planning for the group. Zamia in the New World, Cycas in Asia, and Encephalartos in Africa are the most threatened genera. At least two species are confirmed extinct in the wild, Encephalartos woodii and Encephalartos relictus, both formerly in Africa. This pattern reflects the current pressures on species in these regions. Cycads are long-lived with infrequent reproduction, and most current populations are small, putting them at risk of extinction from habitat destruction and stochastic (chance) environmental events. Regionally, Australian cycads are the least at risk, as they are locally common and habitat fragmentation is low. However, land management with fire is thought to be a threat to Australian species. African cycads are rare and are thought to be naturally decreasing due to small population sizes, and there is controversy over whether to let natural extinction processes act on these cycads. Cycad seeds are not CITES regulated. APPENDIX I seeds are treated the same as the plants. Chamberlain, C. J. 1919. The Living Cycads. Chicago: University of Chicago Press. Chaw, S. -M., C. L. Parkinson, Y. Cheng, T. M. Vincent, and J. D. Palmer. 2000. Seed plant phylogeny inferred from all three plant genomes: Monophyly of extant gymnosperms and origin of Gnetales from conifers. Proceedings of the National Academy of Sciences 97: 4086-4091. Chaw, S. -M., T. W. Walters, C. -C. Chang, S. -H. Hu, and S. -H. Chen. 2005. A phylogeny of cycads (Cycadales) inferred from chloroplast matK gene, trnK intron, and nuclear rDNA ITS region. Molecular Phylogenetics and Evolution 37: 214-234. Chaw, S. -M., A. Zharkikh, H. -M. Sung, T. -C. Luu, and W. -H. Li. 1997. Molecular phylogeny of extant gymnosperms and seed plant evolution: Analysis of nuclear 18s rRNA sequences. Molecular Biology and Evolution 14: 56-68. De Luca, P. 1990. A historical perspective on cycads from antiquity to the present. Mem. New York Bot. Gard. 57: 1-7. Retrieved April 11, 2007. Donaldson, J. S. (ed.) 2003. Cycads Status Survey and Conservation Action Plan. Gland, Switzerland: IUCN—the World Conservation Union. ISBN 2831706998. Donaldson, J. 2003. Chapter 3, regional Ooerview: Africa. In J. S. Donaldson (ed. ), Cycads Status Survey and Conservation Action Plan, 9-19. Gland, Switzerland: IUCN—the World Conservation Union. ISBN 2831706998. Donaldson, J. S. 2004. Saving ghosts? The implications of taxonomic uncertainty and shifting infrageneric concepts in the cycadales for red listing and conservation planning. In T. Walters and R. Osborne (eds. ), Cycad Classification: Concepts and Recommendations. Wallingford, Oxfordshire, UK: CABI Pub, 13-22. ISBN 0851998712. Donaldson, J., K. D. Hill, and D. W. Stevenson. 2003. Chapter 2: Cycads of the World: An Overview. In J. S. Donaldson (ed. ), Cycads Status Survey and Conservation Action Plan, 3-8. Gland, Switzerland: IUCN—the World Conservation Union. ISBN 2831706998. Donaldson, J. S., A. P. Dehgan, A. P. Vovides, and W. Tang. 2003. Chapter 7: Cycads in trade and sustainable use of cycad populations. In J. S. Donaldson (ed. ), Cycads Status Survey and Conservation Action Plan, 39-47. Gland, Switzerland: IUCN—the World Conservation Union. ISBN 2831706998. Golding, J. S., and P. J. H. Hurter. 2003. A Red List account of Africa’s cycads and implications of considering life-history and threats. Biodiversity and Conservation 12: 507–528. Gonzàlez-Astorga, J., A. P. Vovides, M. M. Ferrer, and C. Iglesias. 2003. Population genetics of Dioon edule Lindl. (Zamiaceae, Cycadales): biogeographical and evolutionary implications. Biological Journal of the Linnean Society 80: 457-467. Gonzàlez-Astorga, J., A. P. Vovides, and C. Iglesias, C. 2003. Morphological and geographic variation in Dioon edule. Botanical Journal of the Linnean Society 141: 465-470. Gregory, T. J., and J. Chemnick. 2004. Hypotheses of the relationship between biogeography and speciation in Dioon (Zamiaceae). In T. Walters and R. Osborne (eds. ), Cycad Classification: Concepts and Recommendations. Wallingford, Oxfordshire, UK: CABI Pub, 137-148. ISBN 0851998712. Hill, C. R. 1990. Ultrastructure of in situ fossil cycad pollen from the English Jurassic, with a description of the male cone Androstrobus balmei sp. nov. Review of Palaeobotany and Palynology 65: 165-193. Hill, K. D. 2003. Chapter 4: Regional Overview: Australia. In J. S. Donaldson (ed. ), Cycads Status Survey and Conservation Action Plan, 20-24. Gland, Switzerland: IUCN—the World Conservation Union. ISBN 2831706998. Hill, K. D. 2004. Character evolution, species recognition and classification concepts in the cycadaceae. In T. Walters and R. Osborne (eds. ), Cycad Classification: Concepts and Recommendations. Wallingford, Oxfordshire, UK: CABI Pub, 23-44. ISBN 0851998712. Hill, K. D., D. W. Stevenson, and R. Obsorne. 2004. The world list of cycads. Botanical Review 70: 274-298. Jones, D. L. 2002. Cycads of the World. Smithsonian Institution Press. ISBN 1560982209. Keppel, G., S. W. Lee, and P. D. Hodgskiss. 2002. Evidence for long isolation among populations of a Pacific cycad: Genetic diversity and differentiation in cycas seemannii A. Br. (Cycadaceae). Journal of Heredity 93: 133-139. Norstog, K. J., and T. J. Nicholls. 1997. Biology of Cycads. Ithaca, NY: Comstock Pub. Assoc. ISBN 080143033X. Walters, T., R. Osborne, and D. Decker. 2004. We hold these truths…. In T. Walters and R. Osborne (eds. ), Cycad Classification: Concepts and Recommendations. Wallingford, Oxfordshire, UK: CABI Pub, 1-11. ISBN 0851998712. Whitelock, L. M. 2002. The Cycads. Portland, OR: Timber Press. ISBN 0881925225. Palm and Cycad Societies of Australia (PACSOA). This page was last modified on 22 November 2017, at 17:15.